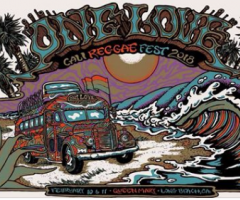 It was the morning of Saturday February 10th, 2018 along the Long Beach bay when the gates of the 3rd Annual One Love Cali Reggae Festival opened to greet attendees with loving arms. 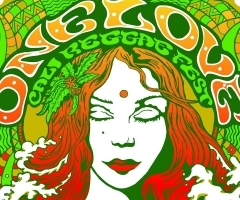 Just adjacent to the stoic Queen Mary shipliner, One Love Fest 2018 consisted of two stages, Flav and Main, with a walkway connecting the two both underground and overhead. Festivalgoers began arriving by the busload as Iya Terra kicked off the Main Stage and Dubbest christened the Flav Stage next to the main food and vendor village. White Glove Service, The Movement, Brewfish and The Steppas were up next, pushing forward the day with epic high-energy performances. And then, Fortunate Youth happened. 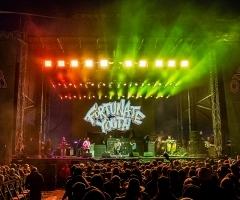 The grounds were already jam-packed as FY stole the show, with a daughter dancing alongside her guitarist father, larger than life blunts being passed around courtesy of We Should Smoke and a surprise Pepper collaboration via Bret Bollinger. It was truly a once-in-a-lifetime experience. It was truly a once-in-a-lifetime experience. Vibes were high (among other things), as the day progressed with The Holdup, another set from Dubbest (poor Giant Panda got snowed in somewhere and couldn't make the party), Matisyahu and Jesse Royal. The full Pepper triad took the Main Stage next for an Ohana island party, followed by J Boog's island sound. Back on the Flav Stage, Tomorrows Bad Seeds slayed so hard, one Top Shelf photographer accidentally dropkicked her camera attempting to skank and shoot at the same time. The camera lived and it was well worth it, since TBS doesn't mess around when it comes to absolutely thrilling an audience. Around this time, the sold out Day 1 started living up to its status - it was almost too crowded to navigate! That was when the hard part happened: which stage do you choose when each had an equally epic lineup to close down the night? 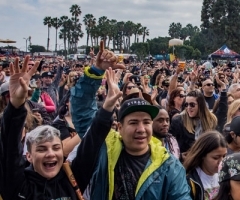 The Flav Stage showed off the talents of Josh Heinrichs, Ooklah the Moc, Ballyhoo!, Collie Buddz and Twiddle while the Main Stage ended with reggae rock's greatest Iration, hip hop's collosal Atmosphere and then, of course, the rocking set of Rebelution. You thought that was enough? Oh, no. Cue the afterparty. Back on the ship, The Simpkin Project kicked off the Saturday night after party aboard the Queen Mary, followed by Easy Star All Stars doing their entire Dub Side of the Moon album. It was transcendental, to say the least. The party continued well into the early morning, with Fortunate Youth jamming a different set than earlier and gaining hands down the One Love Day One MVPs status. With so much action in just one day, it was crazy to think that there was still another full day of One Love Cali Fest to come. Stay tuned for the Day Two gallery, coming soon.